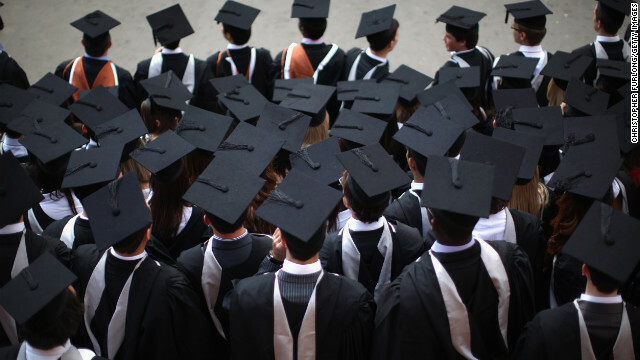 (CNN) – A report released Wednesday by Excelencia in Education revealed the top colleges graduating Latinos in the U.S. The report titled "Finding Your Workforce: The Top 25 Institutions Graduating Latinos" included information on public, private and for profit and non-profit institutions graduating the most Latino students. Education Week has a write-up on the report and some of the trends it reveals, including the prominence of for-profit institutions as the top route for Latinos seeking certificates. Excelencia in Education is a Washington D.C.-based organization advocating academic success for Latinos. According to the organization, Latinos will represent nearly a quarter of the college age population in 2025, but only 7% of Latinos ages 18-24 had an associate’s degree or higher in 2009. Wow I am amazed by the hatred and ignorance displayed by some of the people here. First of all, we ALL are immigrants. It doesn't matter how long you have lived here, at point you great, great grandparents came here as immigrants. The only people who have original rights to this place are Native Americans! Secondly, immigrants made this nation what this country is today through blood, sweat, and tears!! My parents came here as immigrants and worked their butts (paid their taxes) to send their kids to college. And now we work just as hard and pay our share of taxes so don't you dare accuse us of being free loaders!!! Instead of being so ignorant go educate yourselves before making stupid comments that make no sense! I am 100% Mexican and dam proud of it and my child is in College and my husband and I are paying the cost all the way. So do not go stereotype a culture because we do have one. Instead you should be looking into cutting welfare all together and let see who comes out on top. Our school are not graduating them- they are embracing and mastering the english language and realizing the road to welfare and public assistance isn't the way to be successful and provide for your family. Yep Latinos get right into schools with free money while us native white folks are forced to claw our way to the top. Put all the illegals on a boat and sink it in the gulf! your probably from some hick town. Right on Sue. Could not agree more. We work our asses off growing up, and they waltz in with all the scholarships. When I was a senior in high school, I actually checked the box "hispanic and latino decent" on one app, and got accepted despite my SATs not being the level required, (2100+). Coincidence? Doubt it. Dumb @$$. Latinos aren't only mexicans. Your ideotic comment only shows a poor education and a nonsense or out of touch reality about the world around you. And definitively: you are not even a graduate from anything. How about the College of Agriculture and Mechanical Arts, University of Puerto Rico, which has one of the best engineering schools of the Americas, whioch costs a fraction of what similar E-schools cost in the 'states (my alma mater)??? Where did YOU graduate from, Slick?? I see you like to pick and choose your points to make your slanted argument seem more factual. The article also lists two other legit universities. No comments? CNN just change the story to "Latinos are less intelligent" (no offense intended) and I bet hundreds of people would post then.